Earlier, ex-President Mohammad Khatami said the hearings were "show trials" that would harm the establishment. The comments came ahead of a ceremony to endorse Mahmoud Ahmadinejad as the winner of June's presidential election. Ten more people were brought before the court on Sunday, reports said. The detainees, all held in the wake of the disputed elections on 12 June, include several leading reformers. Some are accused of rioting and vandalism, as well as the more serious conspiracy charges. They were among thousands of Iranians who rejected the official declaration that Mr Ahmadinejad had won the election. On Monday, Supreme Leader Ayatollah Ali Khamenei is due to officially endorse Mr Ahmadinejad as the winner of the vote. He will be formally sworn in on Wednesday. The BBC's John Leyne says that once the president is sworn in, his challenge will be to assemble a credible team of ministers that will be endorsed by parliament. Mr Khatami, in comments on his website, expressed hope that Saturday's trial would not "lead to ignorance of the real crimes", the Associated Press reports. The AFP news agency quotes Mr Khatami, who was president from 1997 to 2005, as making more outspoken criticism of the trial. "What was done yesterday is against the constitution, regular laws and rights of the citizens," his office quoted him as saying. 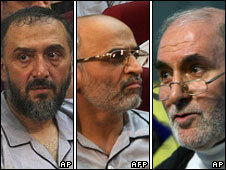 Mr Mousavi's comments went even further, accusing the authorities of forcing the detainees to confess to the crimes. "The teeth of the torturers and confession-extorters have reached to the bones of the people," he said. "Witnessing such trumped-up trials, the only judgment that the conscience of humanity can make is the moral collapse and discredit of its directors." Mohsen Rezai, the only conservative to have challenged Mr Ahmadinejad in the election, also criticised the trial, saying people who had attacked the protesters should also be put on trial. Earlier Fars news agency reported that a group of Iranian MPs had filed a complaint against Mr Mousavi several weeks ago, calling for him to be put on trial for "directing recent riots". 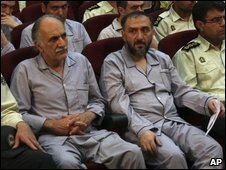 Hardliner Mohammad Taghi Rahba said Mr Mousavi and Mr Khatami were the main culprits behind the unrest. At Saturday's trial, defendants in prison uniforms were seated flanked by guards. 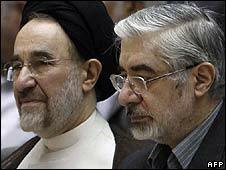 They included supporters of opposition leaders Mr Mousavi and Mehdi Karroubi, and aides of Mr Khatami. The semi-official Fars news agency reported that former deputy foreign minister Mohsen Aminzadeh, former government spokesman Abdollah Ramazanzadeh, former senior lawmaker Mohsen Mirdamadi and former Industry Minister Behzad Nabavi were among those on trial. The BBC's Kasra Naji says the timing and scale of the trial came as a surprise and suggests Iran's leadership wants to send a message to stop any more protests. Foreign media, including the BBC, have been restricted in their coverage of Iran since the election protests turned into confrontations with the authorities in which at least 30 people were killed. Opposition groups alleged widespread vote-rigging. Post-election protests saw the largest mass demonstrations in Iran since the 1979 revolution, which brought about the current Islamic system of government.